현재 건물은 지층에 식당이 있고 상층에 사무실이 위치해있는 4-5층의 전형적인 한국적 유형의 건물 중 하나이다. 건물이 위치한 강남구의 한 먹자골목 일대의 이 건물을 포함한 모든 건물들은 낡은 파사드와 비슷한 모양이라는, 같은 문제를 떠안고 있다. 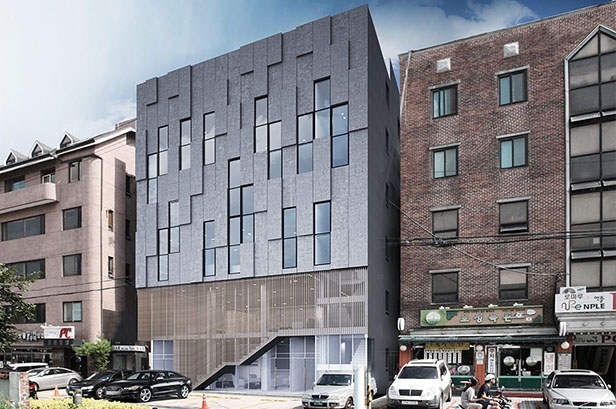 The existing building is one of typical typologies in Korean architecture, 4-5 story volume with restaurant on ground level and offices on upper floor. It is located in restaurant district in Gangnam area, Seoul and most neighbor buildings including this have same problem with aged facade with similar look.